Looking for a book to get your young son reading? Often, as a mom or dad, you just need to find the right book to fit your child. Read about these Kid-Approved Favorite Books for 9 Year Old Boys or 8 year-olds or 10 year-olds or any kids under the age of a tween boy. I love it when my kids find a book they love and want to read. Reading is so important for kids and can instill a love for a lifelong hobby of reading. The best hobby ever! These book ideas also make great birthday presents and Christmas/holiday gifts. Inspire boys to read more books! 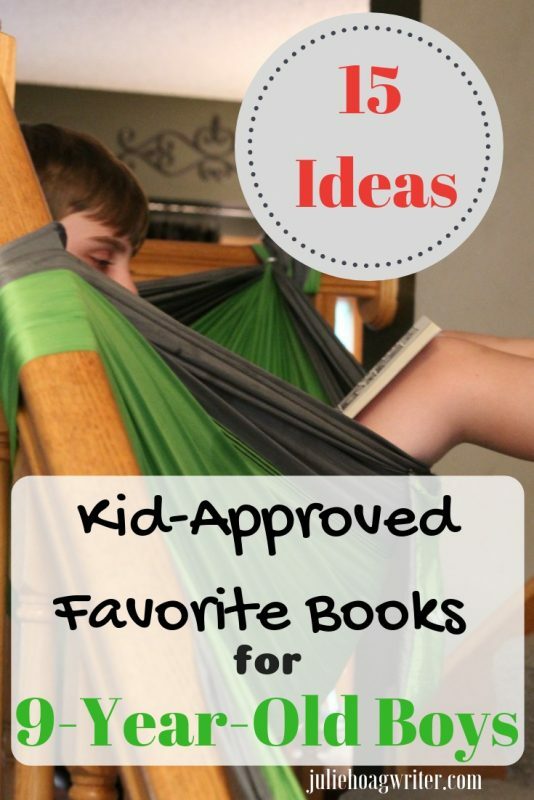 Give them books they want to read and a fun spot to read, like in a hammock. As a mom, and a lover of reading myself, it’s important to me to get my kids reading, and keep them reading. Sometimes the key to keeping them reading is finding a book that fits them. A book they love and don’t want to put down, therein lies the genius and the magic of generating a love of reading in a child. There are many options out there and I’m sharing the favorites of my boys when they were 8 and 9 years old so you too may spark a joy of reading for your own child or grandchild. Of course with the word underpants, boys are gonna be drawn to this book series because they will think it’s funny that he is in underwear. It’s so popular it’s been made into a movie! It’s a book series that is goofy and fun which is perfect for young boys. They will giggle at the name and Captian Underpants’ picture and dive into this book series with a wild and enthusiastic passion. The book series is sold as a set or the books can be bought singly. This has also been a big favorite book series at my house. Stink is a lovable guy who has lots of adventures. One of my sons has read all the books more than once. There are black and white illustrations throughout the book as well. The illustrations are fun to look at while reading and comic book like in their design. This series can also be bought as a set or singly. We just ordered this one pictured below, my son can’t wait to read it! We have pet guinea pigs so of course, the book pictured below was a fave! These books are very well known for a very good reason because kids love them! Several of the books have been made into movies–we’ve seen those too. They were by far my oldest sons’ favorites when he was 8-12. He read them and then reread them again, some more than twice! If a writer can get boys to read a book and then reread it, they have got a gift! Check out these books:) They can be purchased as a set or bought singly. Kids love the storylines and the illustrations. Super winner here! Diary of a Wimpy Kid Collection 13 Books Set (Double Down, Old School, Hard Luck,Third Wheel, Cabin fever, The Ugly Truth, Dog Days, Do-It-Yourself Book, Diary of A Wimpy Kid,Rodrick Rules.. It all started with book #1! My son found these wonderfully illustrated books at his school library. He read the first one and he was hooked! The school library didn’t have them all so we went to the community library but they only had one so the others had to be shipped over and he had to wait a week. He was devastated that he had to wait. These fun books fall under the comics and graphic novels category (so not a chapter book). The illustrations are gorgeous and inspired both my son’s imagination and excited squeals as he read (I love that!). The comic book style was a favorite of my youngest son and I loved how he would retell me the story by trying to describe the illustrations along with the storyline. He would laugh and giggle as he told me all about it. He just couldn’t contain his excitement! It was so cute! Geronimo Stilton runs a newspaper and loves to write stories. There are many different storylines, adventures, funny moments, and also books with holiday themes. The illustrations are creative and fun for kids to peruse as they read the books. My middle son is tagged in our family for finding this gem of a book series. He loved it so much and spread the excitement on his younger brother who has now completed the whole series. This book series is super fun with creative ideas, themes, and illustrations. These books have super fun themes and storylines that my boys have totally fallen in love with. A great gift to inspire reading in young boys! Boys love all that stuff!! This books series is a fun one too. Stanley gets flattened and is, therefore, able to be shipped around the world for adventures. The books take Stanley on trips around the world. The books include fun illustrations too. My sons’ third-grade teachers have had a long-standing tradition for the kids to make a flat Stanley and mail it to someone they know (family or friend) who can give the paper Stanley adventures in another state. They take pictures of him on his fun experiences in a far-off location, wherever that may be (sometimes even on a vacation). Then they send the paper Stanley back and the child shares with the class about the adventures the paper Stanley has gone on throughout the year. My kids always chose grandparents who live out of state to send their Stanley’s too. Worked great and created intergenerational bonding over long distances. Alternatively, my oldest took his laminated paper Stanley on adventures in our home state and then shared pictures and stories about the experiences and fun he had with Stanley over the whole year. It was a super fun activity because we also visited Arizona that year so we got lots of pictures of the Stanley on cacti. This one was a favorite! There are many books and different reading levels for the Flat Stanley books. Also sold in book sets. My boys have adored these books for years. All three of them have been exquisitely drawn to these books. Anything with a battle and a winner is exciting to them. They loved learning about the animals while both animals tried to survive the fight. Great books for animal lovers and kids interested in science. The books are jam-packed with facts and information making them perfect for science and nature lovers. The books in this series are not chapter books so they are great for when your son (or daughter) doesn’t want to read a chapter book, but still wants (or needs) to read. There are lots of pictures and illustrations. These books are sold as a set or singly. The lion versus the tiger battle. The Komodo dragon versus the king cobra. I admit it, this picture makes me squirm and feel squeamish. Ick! The hornet versus the wasp. The tyrannosaurus rex versus the velociraptor. These books were a favorite of one of two of my son’s when they were the ages of eight to ten. The books walk the reader through a story of how young kids survive an actual disaster in history and how the child character was a hero. I love how the writer instills hope and resilience into stories of true historical disasters. The tragic topics in the books are handled delicately and are age appropriate for 8-12-year-olds. I think these books are a great introduction to history topics for kids. They turned my son into a bit of a history buff! The books can be bought singly or in a set. These books are nice in that they are somewhat short at 100 pages or less. The toolbox pictured below contains 10 books. I believe the topics covered in the toolbox include Pompeii, the Nazi invasion, the Japanese Tsunami, Gettysburg, 9/11, the San Fransisco Earthquake, Pearl Harbor, Hurrican Katrina, shark attacks, and the Titanic. This lovely book is perfect for all the animal lovers. Little mouse, Mistflower, is lonely. Silk, a small kitten, is lost and so lonely he thinks he might die of it. When they find each other it’s the start of a friendship that takes them into a life-changing adventure. Many friends come to their aid, from cows and swans to Storm, the sheepdog. But they make a dangerous enemy who is determined to rid herself of both of them – no matter what it takes. In their darkest hour, when all seems lost, the two friends need a miracle – but miracles are thin on the ground. This book is full of fun ideas, activities, projects, and experiments. A great book for a boredom buster for both boys and girls. The book is perfect to occupy young kids while they are learning at the same time. Yay! That’s what I want for my boys! This book lists ideas to build things, discover new ideas, and inspires play. Topics include science experiments, survival sections, making gadgets, construction ideas, entertainment, and trickery. Big interests of my boys! They adore this stuff! Visit one of the authors of this awesome book at Writing for Children. The big draw here for my son was the Yeti. Who doesn’t love a Yeti story?? He bought it at the school book fair and loved it! This is another favorite book series my boys adored. Super fun stories for kids with some black and white illustrations. This crime-fighting vampire dog and his owner will surely entertain your son! I was really struggling with one of my sons to find new books for him to read in third grade. He wasn’t interested in anything I could find. But his teacher, bless her amazing soul, turned him on to the character of Humphrey the hamster because she read one of the books to the class. My son has always loved animals, so this was a perfect solution for meshing his reading needs with his personal interest in animals. He was off and reading! I am thankful for many of these book ideas that were brought to my kids from their teachers, from their school library, from the school book fair, and from classroom book orders. What a gem a wonderful teacher and school can be for a young eager mind searching to match their own individual interests to a magnificent children’s author. When a child finds a book they fall into and enjoy, it’s like a mind meld with the author. How lucky we are to have such wonderful creative authors in our world!! I hope you have found this post useful in finding books for the young boys in your own life. Thanks for visiting my site! DIY Craft Bin for Boys with STEM Focus. I didn’t realize Captain Underpants was a series! I’ll have to check it out. Yes, it’s a series. My son adores it!! Very nice post, I’ll have to check these books out for my little brother, I am sure he’ll enjoy some of them! It can be difficult to get that age to read! Great picks! Yes, it can be difficult to get this age to read. The teachers at our school require 30 minutes of reading a day as homework, so that really helps me get my kids reading:) Thanks for the comment! They are really good ones, my sons all have loved all of these books. Thank you! The hammock on the cover, is that yours? My son would love that but I can’t make the picture out fully. I hope you found some great ideas! 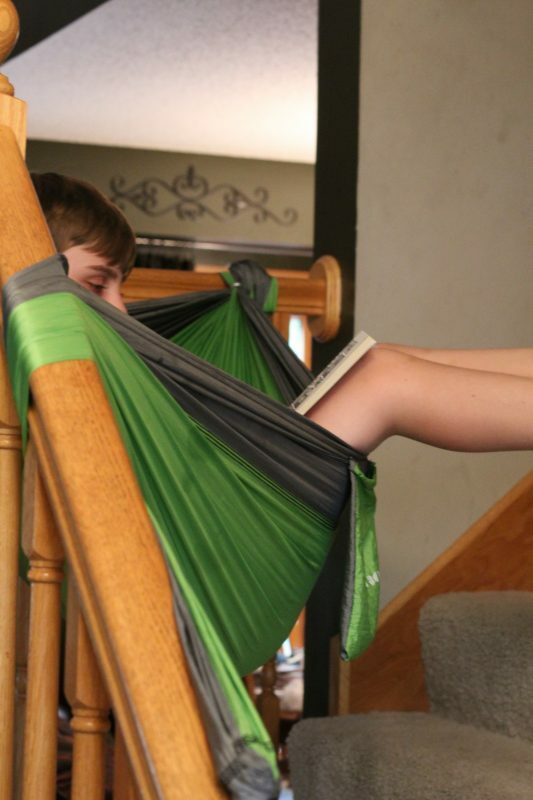 The hammock link to purchase is in the post, just scroll in it to find the link. I purchased it online. Hope your child loves it!! Enjoy!! My son sure loves it and the books too!